In order to develop the concept of transitions between excited states of atoms based completely on the formalism of quantum mechanics, time-dependent perturbation theory will be described and then applied to the problem of spontaneous emission of an excited atomic state. Every author faces a dilemma when trying to do this at an undergraduate level. The difficulty is that spontaneous emission can most properly be thought of as an interaction of the quantized radiation field with an atom. To do that interaction properly one should quantize the radiation field and apply second quantization to the atom. All of that is beyond the scope of this text, so what is to be done? 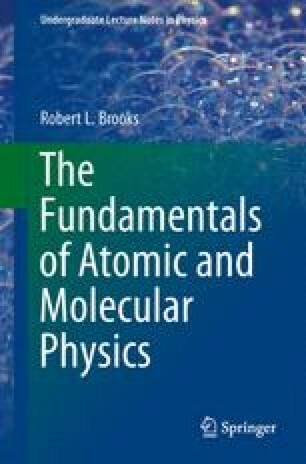 Many authors choose to do a semiclassical treatment in which a classical radiation field interacts quantum mechanically with an atom. The level of detail varies considerably. This presentation will attempt to be complete, explicitly stating where a result from more advanced quantum mechanics is invoked, even as that result is explained and motivated.